A.K. Burns, Unknown Uknown, 2016. Sculpture. In a 2002 Pentagon press conference, former Secretary of Defense Donald Rumsfeld addressed a question about Iraq’s alleged weapons of mass destruction with an unforgettable evasion: there are known knowns, known unknowns, and unknown unknowns, the latter being the most precarious. In a trilogy of nearly identical sculptures by A.K. 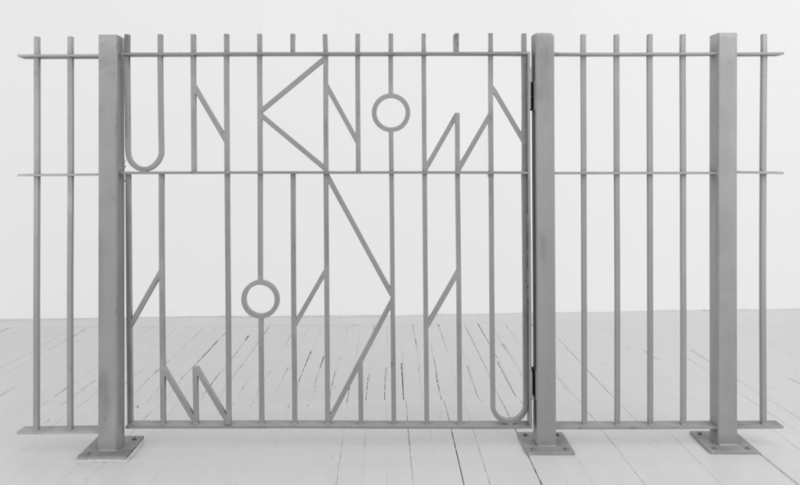 Burns, the artist conjures the same string of word compounds on a metal gate nearly 15 years after Rumsfeld’s infamous statement. Resembling ubiquitous black fences across New York City, Unknown Unknown presents the paradox of this statement as a physical division and linguistic deviation, acting jointly as both a threshold and obstacle. A.K. Burns (b. 1975, lives and works in New York) is an interdisciplinary visual artist, working with video, installation, sculpture, collage, poetry, and collaboration. She graduated from the Rhode Island School of Design and received an MFA in sculpture from Milton Avery Graduate School of the Arts at Bard College. Burns was a 2015 Creative Capital grant recipient in the Visual Arts category.